Ever since iPhones came equipped with the soothing tones of Siri, artificial intelligence entered the mainstream. Whether answering basic questions or finding information on local architecture, artificial intelligence (AI) simulates human intelligence such as visual perception, speech recognition, decision making and even language translation. From the insurance industry’s anti-fraud efforts to the latest automobile technology (self-driving mini-vans anyone?) AI is revolutionizing products and services throughout the business world. From Google to Sony to Facebook, the big players are investing in AI and smart money is on its continuing relevance to emerging business. 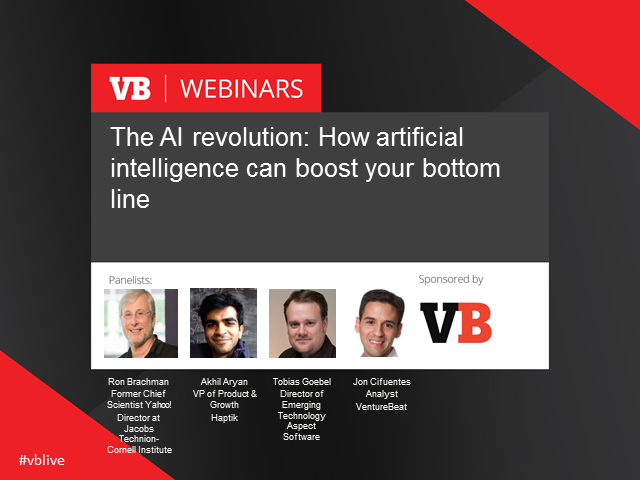 Join this VB Live event where experts lay out the AI landscape, tell you what you can expect in the next few years and the potential impacts on your bottom line. * Ron Brachman, IEEE Fellow, Former Chief Scientist of Yahoo! * Akhil Aryan, VP of Product & Growth at Haptik. Ron Brachman, IEEE Fellow, Former Chief Scientist of Yahoo! Presented by: Ron Brachman, IEEE Fellow, Former Chief Scientist of Yahoo!